Puppets aren’t for everyone – some people are a little suspicious of their hollow centres, beady eyes and lack of a voice. And, you know, the fact that there’s a human hand inside. 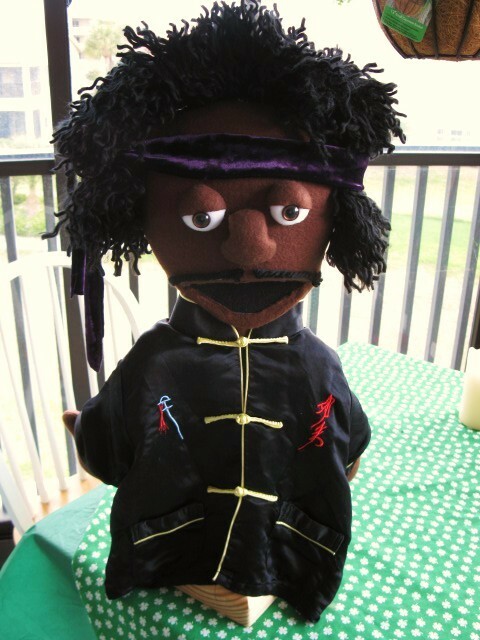 But I think there’s a lot to love about these puppets, made by Erica in Florida and sold at her etsy shop Sublimations. Erica’s specialty is customising puppets to look like their owners – so you can get a pair of lookalike puppets as a wedding gift, or a mini-me puppet for a friend. Erica reminds shoppers that she makes puppets, not photographs – she encourages people to ‘close their eyes and imagine they’re a puppet on Sesame Street’ to get an idea of what to expect. Erica’s website features lots of pics of puppets & their people, so you can see just how closely they match. But since we don’t know those people, I thought I’d stick with some of the more famous faces (and half bodies) that Erica makes. Like Jimi Hendrix here. Down to the detail of making outfits for the puppet that match famous photos of the singer from back in the day. Brilliant. And I’ve written before about the love that some people (not me) have for bacon. From toothpaste to bandages to wallets and everything in between. 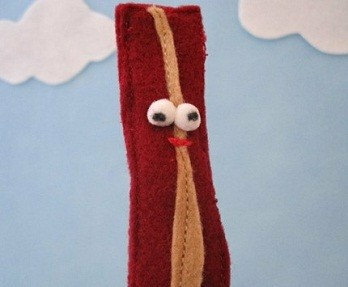 We can now add finger puppets to the list, as Erica includes a rasher of bacon in her range. Six inches tall, Erica says it’s the perfect gift for anyone who loves bacon so much they want to “BE bacon”. And I have no doubt that those people exist. 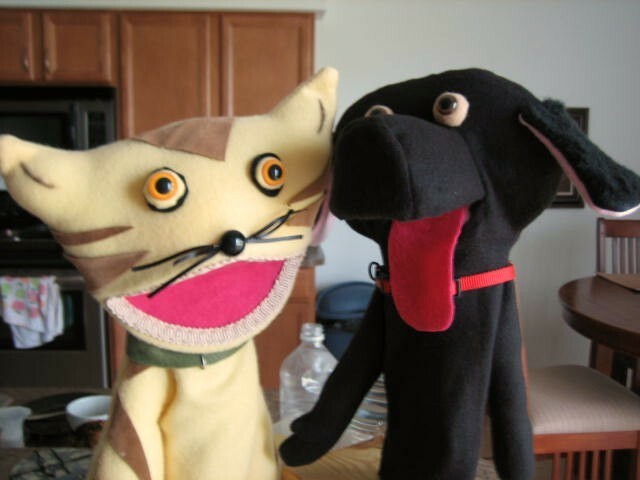 Here’s an example of a puppet couple. All you have to do is send a photo and a description of the couple in question (to get a sense of wardrobe, jewellery etc, I guess) and Erica will turn a couple of people into a couple of puppets. Such a great gift idea, especially for people who seem to have everything. Bet they don’t have small versions of themselves made from felt and wool and stuff. Yet. These are just a sample of the fantastic puppets available at Erica’s shop – you can check out Sublimations here. You’re welcome! I LOVE the idea of a puppet couple! What a great find, Sparks.. You’re a wee legend! 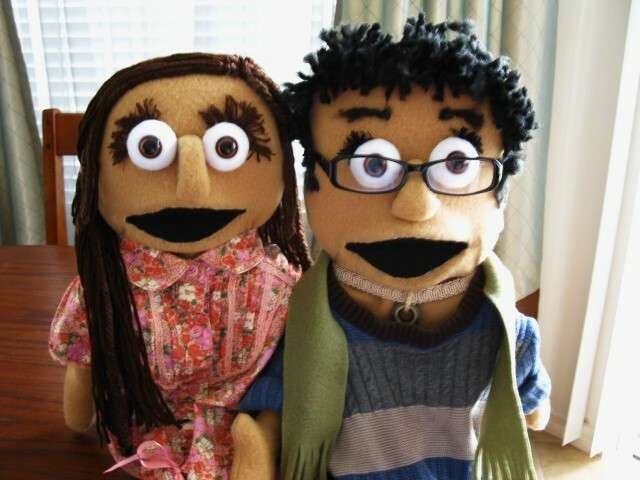 I love the puppet couple – the perfect gift for those with a fear of confrontation. Couples can express their dissatisfaction through their puppet egos (along with suitable,non-confrontational voices) and thus make it impossible for the other to get upset.